Photos inadequately capture the vast devastation and the human suffering caused by the massive EF-5 tornado that destroyed much of Joplin. Three weeks ago tonight an extremely powerful tornado destroyed nearly 25% of Joplin, a town of about 50,000 in southwestern Missouri. 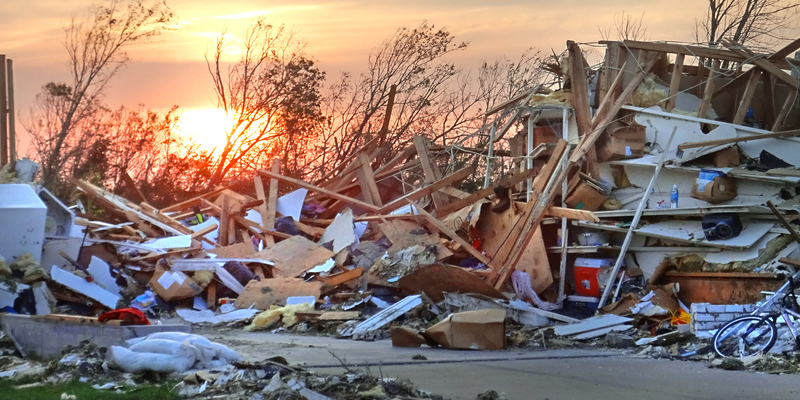 Killing more than 150 people, the EF-5 tornado ranked as the deadliest to hit the United States in more than 60 years. Listed as the seventh deadliest tornado in U.S. history, it was also the 26th deadliest in world history. During the 20 minutes the tornado was on the ground in Joplin, 2,000 buildings were destroyed along the 13-mile trail of indescribable destruction. I learned about the monster tornado from breaking news on TV and within minutes my phone started to ring. As media contact for the American Red Cross in Kansas City, I began fielding questions about the relief efforts already underway. That evening I was on the TV news, and by 5 a.m. the next day I was being interviewed live on TV in the Red Cross parking lot even before I stepped into my office. Local media attention remained intense for the next several days. Then our national office in Washington, DC asked me to deploy to Joplin to serve as a member of the public affairs team. For the next two weeks I was there with 700-some other Red Cross workers—many from Kansas City—who came from across the nation to help the people affected by the disaster. The role of the Red Cross was extensive and impressive. Our immediate goal, of course, was to ensure the well-being of those affected by the disaster. We initially provided shelter, food and emotional support. In subsequent days we took the lead in doing damage assessment. Throughout the tornado’s footprint, we also provided mobile feeding for the first responders and others working in the disaster zone. From Kansas City we deployed a highly-sophisticated emergency communications vehicle, manned by two well-trained volunteers who provided computers, Internet access, cell phones, cellular service and other communications support at multiple locations where the Red Cross was operational. Visible in the community were many Red Cross workers—nurses, chaplains, caseworkers, fundraisers, government liaisons, shelter workers, feeding coordinators and mental health counselors. Behind the scenes, we were supported by trained, hard-working volunteers who handled the countless details of staffing, training, lodging, transportation, logistics, safety and partner services. My role as a member of the public affairs team was essentially to help people understand how to get help and how to give help. I spent much of my time inside the shelter with those who had lost their homes in the storm. On other days I worked at the public affairs desk (actually a folding table) in the job headquarters. Sometimes I was in the field where we delivered food and bulk supplies. A couple of days I also worked at the Multi-Agency Resource Center, a one-stop location operated under the unified command of the Red Cross, the Salvation Army and FEMA. I lost track of the number of times I was interviewed by television, radio and newspaper reporters. One of my most satisfying moments, though, came as I was listening to the radio as I drove to headquarters. As the radio announcer told the people of Joplin how to receive assistance, I realized he was reading verbatim a paragraph from a news release I had written a couple days earlier. During a span of 20 days I had only one day off. I’m now back home, realizing that my fatigue was well hidden by an ongoing rush of adrenaline. As I write this, I’ve been back for less than 24 hours and I am still too close to the catastrophe to put everything into proper perspective. Already, though, I am scheduled for later this week to share my observations with the community pillars who will be leading this year’s United Way campaign. Right now, my experience in Joplin looks like a kaleidoscope of randomly-scattered memories. As I continue to sort things out, though, I will share more of my experiences here in upcoming blog posts. Stay tuned! This entry was posted on Sunday, June 12th, 2011 at 8:30 am and is filed under Life in General, Marketing & Strategy, Marketing in a Nonprofit. You can follow any responses to this entry through the RSS 2.0 feed. You can leave a response, or trackback from your own site. 2 Responses to Back from Joplin! Duane, thanks so much for giving us all a ground zero observance of this horrific devastation. My prayers go out to you for your courage and servant’s heart and to the people of Joplin who have to process this grief, recovery and new reality. Again, thanks for sharing.